Rebalance and energise your home with feng shui! Does your home need re-energising? Is your office congested? Do you feel stuck? You probably already know about the mind-body-spirit connection. There are plenty of healing modalities important in contributing to holistic wellness. Feng shui deals with the energy patterns of buildings and their surroundings and how they affect your health and wellbeing. Its aim is to optimise the energy associated with these spaces to positively influence your life, luck and destiny. With good balance and harmony, your home has vitality and is supportive and energetically nourishing for you and your family. Feng shui can be used as an ongoing tool for life success. It can bring about wonderful and sometimes profound changes to people’s lives. When your feng shui is flowing, you can THRIVE. A feng shui consultation with Emerald Space will leave you feeling energised and motivated, with a space that feels great OR YOUR MONEY BACK! Imagine a body of tried and tested knowledge by environmental energy professionals over hundreds of years that outlines the various aspects of home and building design that best supports you. THAT is what feng shui offers. Your home is ALIVE with energy. A thorough personal visit to analyse your building will show you exactly how to bring balance and harmony to your home or workplace. A summary checklist to finish allows you to relax and stay present, then later reflect on your goals. Or you may choose a Premium Package, with a comprehensive report, unlimited contact for 4 weeks and a 30 minute review call. This added value helps you stay focussed and gives you extra support during the process. Emerald Space also offers organising with feng shui for particular rooms, such as home office space, an important aspect of many modern homes. A personal visit is always preferred, however, technology allows exchange of photos and videos online, and is ideal for those in country areas or the desire to simply ‘feng shui’ a single room. Fall in love with your home again, feel joy in arriving back each day, and appreciate the harmony and fresh energy that feng shui brings to your home. Feel energised and motivated with a home that feels great! Transform challenging family relationships into positive ones and be amazed at the difference even subtle feng shui changes make. A Standard feng shui consultation includes a personal summary checklist. Our Premium package includes a comprehensive report, an additional 4 weeks of unlimited contact, and a complimentary review call. Feng shui is a goal-oriented practice. Support during your Premium package allows you to gain continual feedback on your progress. Imagine having your own feng shui coach on call! A personalised visit gives you the benefit of Karen’s holistic, intuitive and caring service. I moved things around as suggested and the following month I went into qualification for a promotion! It’s an enjoyable place to be in and I have space to work and think. I needed help in organising my home office- it was a mess and I didn’t know where to start or what to keep. We sat down and discussed the overall process, the goals and what the outcome would be. We broke it down into chunks and then focussed on one at a time. At the end I felt energised and comfortable, and very happy with the outcome. I knew where everything was and was happy about ditching a lot of material that we didn’t need. We had a roadmap to keep things in place for the future. The desk still gets a little messy at times but we keep on top of it and are moving to electronic formats where possible to reduce clutter. I [now] look forward to it [working in the office,] it’s not a daunting task, I don’t feel crowded, I don’t feel there’s anarchy around me. I know where everything is. Do you have cluttered spaces? Does your home not feel right? Blockages in your home translate to problems in your life. Buying, selling, renovating, building, investing? Feng shui is an alternative to property styling for furnished homes to attract buyers. Avoid harmful structures and design by using feng shui principles to create harmonious buildings or renovations. Discover how your building is preventing you from finding a suitable partner, causing friction in relationships and contributing to stress, depression and anxiety. Or adding to the stress of divorce and separation. Discover your auspicious locations and directions for boosting your career and money related issues. Find out how to improve your decision making and networking mojo. Does your teenager lack motivation? Feng shui can help refocus your child in their studies by adjusting and balancing their environment to align with who they are now and the person they are becoming. 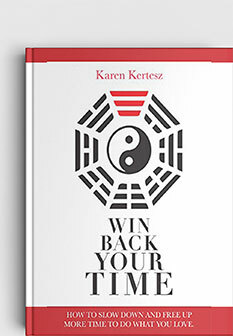 Are you curious about how you can apply feng shui in your own life? How about starting with saving time? 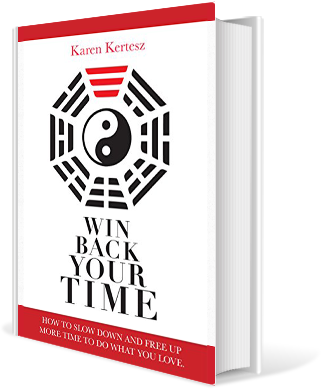 “Win Back Your Time” combines positive mindset with simple feng shui adjustments to create more free time to do what you love. It also comes with a downloadable journal. Yes! I’d love a copy.